Hello friends! 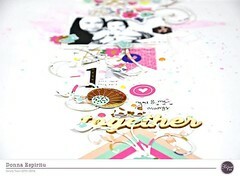 Candace back with you today and I am so excited to share my first project using the September Sundance kit. Guys….I LOVE this kit! It makes this boy mom heart so happy! This kit is filled with lots of blues, greens, yellows and neutrals with themes that fit our family perfectly! We love to spend time outdoors and go on wild adventures together. In case you missed it, here is a look at the kit that you can pick up in the store here. For today’s travelers notebook spread I HAD to use the map paper. For the left side of the spread I cut the map paper slightly smaller than the full page width so I could create a little border on the far left. I wanted the left side of the spread to look like the papers were just dropped on the page, very organic. I added a little backpack embellishment from the die cut pack along with a label for my journaling. I wanted the right side of the spread to feel more organized and balanced. I double matted my photo and added another die cut above the photo. To mimic the border on the left side I added a border strip. I decided to make the border on the right side a little larger than the right to bring a little more color and balance to the right side. I just adore how this little spread turned out! This kit is SO inspiring and when I look at it I am filled with lots of ideas. I can’t wait to share the rest of my projects with you! Make sure you pick up this kit, you will LOVE it! That picture is just adorable and perfect with this kit. Awesome pages! always love your spreads, candace!